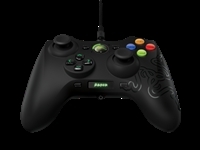 Razer Sabertooth Elite Gaming Controller for Xbox 360 is the supercharged successor to the award-winning Razer Onza. It has been restructured with even more customizability and control options in an all new, rugged design that doesn¡¯t compromise comfort. 6 additional fully-programmable buttons, Forged for improved reliability and mobility, OLED for ease of customizability.